Beetroot lip stain seemed like a really great idea. Foolproof, even. I mean, if it can make your poo red long after it’s been digested, surely it can perform the simple trick of reddening your lips, right? Wrong. It had absolutely no interest in reddening anything as part of a mostly water solution, though it did turn into a wee bit of rather ghetto moonshine after a few weeks. Hrmph. How inconsiderate. Anyhow, I eventually figured I could find another use for my bag of powdered beetroot. Since soap colouring was out of the question thanks to numerous testimonials from readers (apparently it turns brown during saponification, and I am not short of things to turn soap brown), I turned back to cosmetics. Beetroot lip gloss seemed a good place to start, since it wasn’t too far from my original use. Since beetroot is water soluble, lip gloss makes the perfect canvas for it. If you try to stir a bit of beetroot extract into some lip balm (which is totally oil based), you will just end up with a horrifically gritty, awful tube of lip balm. Yuck (I’ve tried it). So, you need something water based to dissolve the extract into. That’s how the lip stain started, and while the beetroot extract dissolved beautifully, it lacked the viscosity to do much of anything on the skin. That’s where the water/oil emulsion of lip gloss comes in. 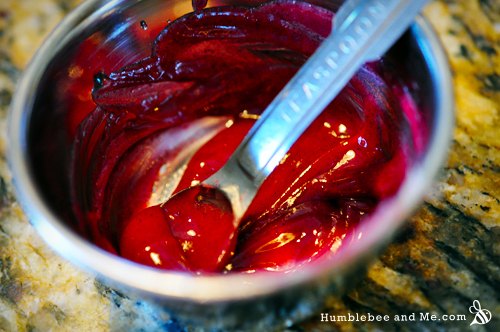 We’ll dissolve the beetroot extract in vegetable glycerin, and then whisk it together with some melted oils and wax to get a beautiful, naturally coloured beetroot lip gloss. Melt the oils together in a saucepan over low heat. Remove from heat and let cool, stirring occasionally. 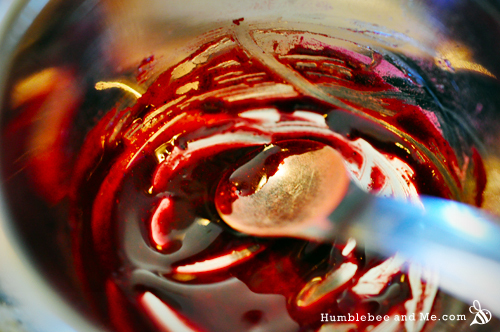 While they melt, combine the vegetable glycerin and beetroot extract, stirring to combine. You should end up with a fairly viscous, dark red mixture. 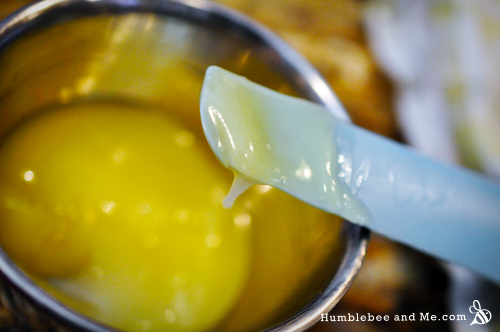 Once the oils have cooled to a creamy, thick mixture, whisk the two parts together. You’ll have a thick, maroon mixture. Decant into squeezy tubes or hard tubes with a wand lid (a syringe or funnel helps greatly here). This recipe will fill four 10mL/0.33fl oz tubes or jars. How colorful is the gloss on? Any lovely pictures modeling it? It’s barely colourful, Zil. I just went to take a photo for you, and you can barely tell I’m wearing anything. It’s mostly just shiny. I love your blog!! I always look forward to Fridays, Saturdays, Sundays, and Mondays because of you! I get so anxious and excited thinking about what you will come up with next. You are truly an inspiration and very generous to share your hard work with others. I admire you, I truly do. Have a wonderful Saturday!!! Aww, thank you so much, Kyra 😀 I always look forward to Friday, Saturday, Sunday, and Monday so I can share my ideas and hear what you think of them 🙂 Thank you so much for your kind words, it is so nice to know what I do here is appreciated. Have a great week & thanks for reading & DIYing with me! I just made this, and it’s lovely 🙂 I like that it’s berry colour–not too red, not too pink. I added 2 drops of 10-fold vanilla to the beetroot/glycerin mix, and some b-free bergamot to the oils. I love it! Mine has an initial slight sandy feeling when applied, but it seems to dissolve after a minute or two. OOoh, lovely! I bet it smells a wee bit like Cream of Earl Grey tea 🙂 Mmmm. I wonder if your beetroot powder didn’t quite dissolve in the glycerin? Perhaps a quick blast in a coffee grinder before adding it would help next time? Have fun with it & let me know how your experiments go! Could it be the GMO and pesticide characteristics of the beet. I don’t use beet sugar to feed our bees for the same reason….too full of toxins. BTW, the substance ” kaolin clay” you used in your face wash is what I use to spray my fruit trees rather than use pesticides…we are organic. This clay is human digestible and is one of the ingredients in Kaopectate…an old over-the-counter formula for upset stomach and traveler distress. This powered clay turns my apple trees almost white (like a Russian Olive) then the insects don’t land as they see the tree as something else they don’t like! Beet root powder and store bought/farmer bought beets are different from GMO sugar beets. Sugar beets are white and tubular, not the ones you buy to eat. They are only used to make GMO sugar. The ones that are red or orange are regular beets and are absolutely delicious roasted with goat cheese crumbles and balsamic reduction! Don’t shy away from these, they are very good and detoxifying. You can buy them Organic , as well. I am anti-GMO so, I checked into that recently. I hope that eases your concerns. Thank you for taking the time to clarify some erroneous points in my post. Growing our household’s knowledge about non-GMO and pesticide-free products is a never ending journey. Your clarification is new learning for me and helps me zero in on what I can buy and use that is healthy for us. Thank you for your many inspirations on this site. I am into my 7th version of hand creams this winter based on your many recipe ideas. Thanks for all you do for so many. The more I learn about the natural/DIY world, the more I’ve learned to question both the names and ingredients of things. Yams, for instance, are not even related to the bright orange things most supermarkets sell as yams. Those are sweet potatoes. True/real yams are indigenous to Africa, and they can grow to weigh up to 70kg! It’s not really an earth-shattering difference in this case, but it just goes to show how easily names can be miss-assigned, leading to confusion. I took a food science class in university and the professor told us that GMOs aren’t generally too prevalent in fresh produce—they’re more common in soy, corn, wheat, canola, and other highly processed crops (meaning processed foods). Now, he didn’t cite any sources, so I’m really not sure how much truth there is to that idea, especially since it’s been a few years since then. In any case, organic food is never GMO, so that’s an easy way to be safe. Thanks so much for reading & DIYing with me! I love your blog! Always a source of fun and inspiration. I use beetroot powder with hibiscus flower tea for a hair rinse on my chestnut turning white hair and I love it. Great for red or brown hair. Sometimes I add black walnut and then folllow with argan oil with jasmine e o on the tips of my hair. Experimenting is fun. Thank you! The color looks magnificent! I need to get my hands on some beetroot powder!!! Where did you get your beetroot powder? 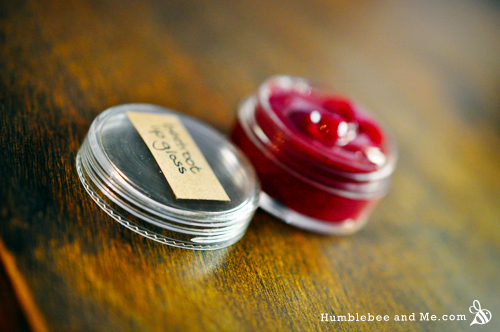 Wonderful idea, I am ordering my beeswax now… DIY is my favorite thing! You’re so creative! I got the beetroot powder from Saffire Blue 🙂 Thanks for reading & have fun! Marie, I’m wondering if the beetroot powder particles are visible on lips, since you don’t strain it left there, right? How bad are these on lips? Great idea, btw! Lovely, beetroot is such a vibrant shade of red! Hi Inna! Thanks for reading 🙂 I need to find many more uses for my beetroot powder as well, this lip gloss won’t devour that entire giant bag lol! I assume it would be good for food colouring, as well. Or blush/powder type stuff? If you could get food grade stuff, I bet it would be awesome 🙂 I’ve never seen food grade beetroot powder, but it would be really cool in things like marshmallows. I definitely need to give it a go for some powder cosmetics, so far it’s proved itself useless in liquids as far as contributing colour goes. I found my beetroot powder at a health food store. It was sold specifically for colouring food. What about using something like emulsifying wax? Is that safe? Would that blend the oil and water mix? I bought a tub of food grade beetroot powder a while ago in attempt to make colour lip balm with it and it did not turn out well at all! On behalf of the beetroot powder and for me too…thank you for this recipe..
Ha! I totally know that little mind trick 😛 I’ve made some pink lip glosses that taste like peppermint and even now my brain still goes “wait, what! ?” when I apply them. After reading a few of your lip gloss recipes..the next question is, where do I get the lip gloss tubes? Thanks, as always! I got the tubes from Soap & More here in town, and so far haven’t seen anything similar for sale online in Canada (well, you can order from them online, but from anywhere else). This sounds like a great recipe, I love your blog, there is so much inspiration! I just have one question, since you’re using glycerine (contains water) don’t you need a preservative to prevent mold and bacteria? How long will this last without it, any thoughts? Hi Maria! Glycerine doesn’t actually contain water, it is water soluble, which isn’t quite the same thing. It’s a sugar alcohol, formula C3H8O3. I don’t end up needing a preservative for my lip glosses that contain glycerin (and I have one that’s coming up on 3 years old, and it’s still fine). I believe this is because glycerin is a strong humectant, so similar to honey it creates an inhospitable environment for bacteria because it pulls the moisture out of it. That’s just a hypothesis, but in any event, my experience tells me you won’t need a preservative (at least not for a while). Hope that helps! No worries 🙂 Just try not to hoard up so many types of DIY lip gloss that you can’t ever use it all, lol! I’d probably err on the side of caution and include one as additional water needs to be used to create glycerites. Made the lip gloss just now and I’m very excited by the texture of the gloss. I’ll definitely be using the recipe again. Unfortunately, my beetroot powder must not have dissolved into the glycerin because I’ve got chunks. Any ideas for how to save this batch? Hi Eks! You can try giving it a thorough blending in a blender to see if you can break up the chunks, but if that doesn’t work you will likely want to toss it and start over. Thanks for the tip. I ended up straining it all through a very fine mesh strainer to remover the bigger clumps. It’s a much lighter gloss but it saved this batch from the trash. Hmm, interesting. It’s super pink on her finger but I can’t even really tell she’s wearing anything in the photo of her—nice and subtle. Love your blog! Thsnks so much for your informative, creative and beautiful creations that are helping to fuel my diy beauty\soap addiction!! 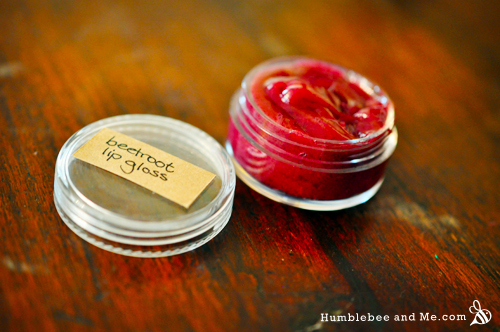 Question: I have tried and failed over and over again to make the beet root lip gloss. I’ve come closest with your recipe (vegetable glycerin! Who would’ve thought!!) But I still can’t seem to get the grainy texture of the powder to either dissolve or soften or whatever. So while it looks nice in the jar, it doesn’t look so hot on. Any tips? What am I doing wrong?? If I could steep the powder in vodka or even use just beet juice and incorporate that I would, but I’m guessing it would separate…I feel like a horribly lame scientist here trying to solve problems I have no understanding of! Thanks so much for that! Worked like a charm ( I had left the beet and glycerin mix for like 2 weeks because life got in the way…). Pressing it through the sieve after leaving it to mellow for a few weeks left me with beautiful beety goodness and no grainy grossness! I’m having the same initial problem as Jennifer – it’s so gritty. I’m following all the directions and not sure what is going on. It seems like I need to add more vegetable glycerin (like quite a bit more) as the beet root powder just soaks it right up. I have it over heat and it just becomes a really sticky paste-like texture, so the heat eventually will make it burn it seems. Do you suggest adding more vegetable glycerin? What’s the texture of the glycerin + beet root powder combo supposed to be? I don’t have a sieve and was hoping I wouldn’t need one. Any suggestions to keep this from being grainy would be great! Hmm… what kind of beetroot powder are you using? I ask because it’s the ingredient most likely to have some serious variation, and it seems to be part of the problem. Did you make it yourself? Hello! quick question…If I replace the beetroot in this recipe with a colored Mica, will I need to make any ingredient adjustments? I would like the color to last and beet root seems to oxidize after a bit. Thanks for you help! You’re wonderfully talented btw…! – I don’t think the glicerine I have is vegetable. Will it make a difference? Will it dissolve the beetroot powder? Hi Galyna! If your beetroot powder isn’t very finely ground I’d recommend letting it sit for quite a while (a couple days) in the glycerin and straining it through a fine sieve to remove any chunks. If your glycerin is petroleum derived it’ll be chemically identical, so that shouldn’t be a problem. something’s wrong with the “practicality” of this recipe!
? Did you try the recipe? I’m confused. I tested it quite thoroughly and it works for me, there’s nothing wrong with the proportions when I make it. I started searching for a dark red lipstick recipe on the net since ‘my colour’ is always last of a batch and then it’s discontinued. So instead of trying all the different ‘commercial’ brands that are very expensive and always changing and not good for my health I found your blog and the Red Rose lipstick recipe with red reef clay. IT’S FANTASTIC! Thank you soooo much!!! As a bonus I really really enjoyed making it so much, that I also tried some of your other recipes! I haven’t been reading it thoroughly enough though…. I used agar agar as a vegetable glicerin… and then threw that powder (4gr….) with the beetroot powder in the melting stuff… the colour looked great but the taste and texture came out terrible 🙂 All grainy. Then I read it again and understood that I should’ve made 2 mixtures first before adding them together, and probably not use the agar agar powder or mix it with water first….? Anyway, I couldn’t see it being repaired. Do you use vegetarian glycerine that is already watery? Oh, and I love your articles too, the ones about ‘take note about what you’re doing, you can’t remember the 2 or 3gr. after 3 weeks..’ applies very much on me too. So I finally got myself to write all down during the process. Thank for being such an inspiration and for your perseverance trying stuff out: providing the world with such beautiful recipes to work with!!!!!! Just wanted to add: I found the right Glycerine at the drugstore now.. and will try again. Hi Judith! I’m so thrilled you’re loving my blog 😀 And I’m so thrilled I’ve helped you in your quest for your perfect shade of homemade lipstick! Vegetable glycerin is a clear liquid with a consistency similar to that of syrup, but a bit more goopy. I’ve never seen a dry version, from what I understand it is always liquid at room temperature. Thanks again for reading & DIYing with me! Can you please post a before after pic of yours? I’m sure you’ve tried this, which is why I’m asking… Would adding any more beet root powder make more color show up on your lips? If you can get it to dissolve, yes—I would be worried about reaching the saturation point of the glycerin, though. Just go slowly! do u have any swatches or what it looks like on you because I recently made a not so successful lip balm in a small glass medicine bottle with turmeric , tea , and coffee for color and coconut oil and ghassoul clay but it is not like the market or etsy items . 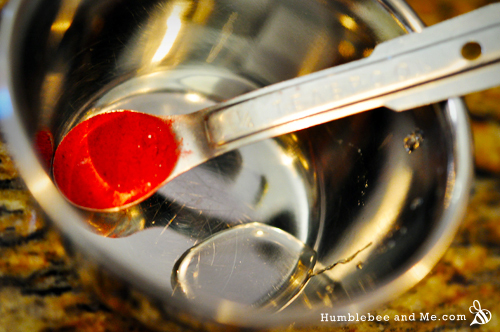 i am thinking of remaking the turmeric lipbalm with beet juice to see if it will change the color from yellow to reddish brown or something like that . I’m afraid I don’t—this recipe is quite old and I’ve long since thrown out this lip gloss. lip gloss -emulsion, therefore needs preservative. can I add any water soluble ingredient, or does it really depend? Hi Angie! 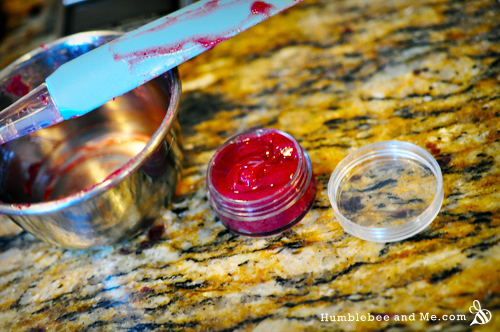 When making lip gloss I tend to stick to glycerin and/or honey as the water soluble ingredient. I’ve found I don’t need preservatives, and I believe this is because they aren’t water—they’re just water soluble. I have tubes of homemade lip gloss that are 4 years old and haven’t sprouted any mould. so most of them are water-soluble. So I figured that meant mixing them in water. But since you brought up glycerin I wonder if I can mix it into that…would you know about that at all? Can you make tea infused lipbalm? I don’t know if it’ll work, but I was thinking of putting in some tea leaves when I melt the oils together in a saucepan over low heat. Has anyone tried this? Will tea leaves infused in hot oil as it does with water? Please let me know if anyone has tried this. Hi Nanz! You definitely can—in fact, such a thing has been on my to-make list for about 2 years now, haha 😉 The process would be similar to this lip balm. Apart from vegetable glycerin, is there any other way to melt the beet root powder without using water ? I’m sure there is, but I haven’t tried dissolving beetroot powder in every liquid substrate imaginable so I don’t really know what those successful liquids would be. Maybe alcohol? Propylene glycol? Polysorbate 20? Marie,I don’t see,in the instructions what to do with the beeswax? 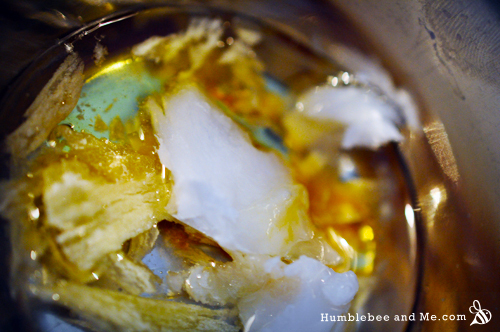 Beeswax is considered an oil as it’s part of the oil phase. Thank you for this very informative post. I wish to replace carmine with beetroot power as a vegan alternative; however, I am not sure if beetroot power can give an intense red/pink pigmentation and is resistant to oxidization to create a red/pink hue for a lip stain/lipstick. I can mix certain oxides to intensify the hue. Some guidance would be much appreciated. If I wanted to make this a bit firmer for a lip balm stick, how much more beeswax or candelilla wax would I need to add? I prefer that method of carrying gloss around, plus i don’t have to stick a finger in the pot! This recipe really isn’t suited to being made in a more solid form due to the amount of glycerin required to dissolve the beetroot powder. 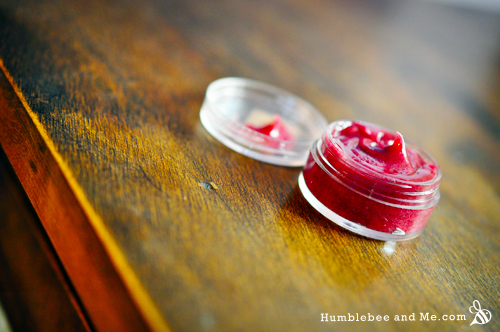 If you want a solid tinted lip balm sort of thing, try this recipe! Do you thing glycerin could be replaced with canola oil/honey in this recipe? Hi there, first of all I would like to say that you are brilliant and I love your articles and videos! 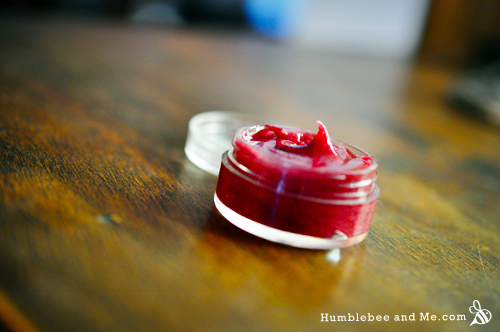 if I want to make small swirls in my diy lip balm, as highlights of a bit of red here and there can I use beetroot powder ? Now you have mentioned that if I mix it in oils it will not dissolve but what if I put it in oils and then strain it really well using a mesh cloth ? Would it still be gritty ? I want to make mine as natural as possible since I’m making a batch for kids and hence I don’t want add any mica or artificial colours ! Please help ! 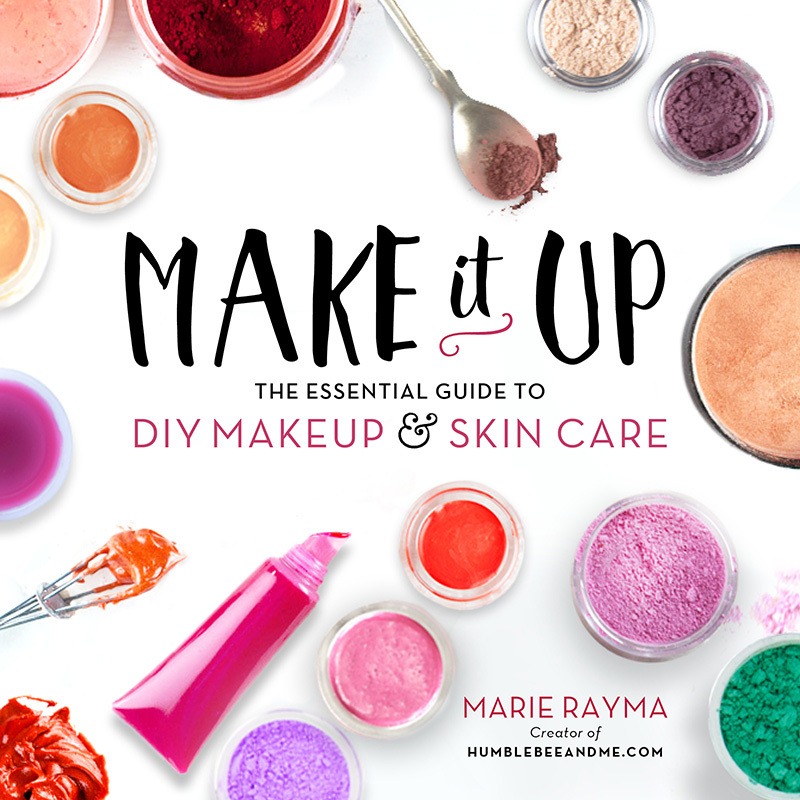 I was wondering why there are so many different oils in your lip gloss recipe? Do the different oils have different purposes in the recipe or can I just use coconut oil instead of also having jojoba, vit E and castor oil? Hi! I have some beet root powder and would love to try this recipe. How disappointing that it doesn’t offer much color. I am allergic to both soy (like stop-breathing allergic) and coconut (hives) and I can’t seem to find any vegetable glycerin that doesn’t use either. Would honey work in this recipe? I’d also have to use a sub oil for coconut, but that’s not a big deal.